Yesterday, a friend commented about the word problems in my Kindergarten assessment and how unbelievable it was that Kindergartners were expected to solve problems of this complexity. When I looked back at the assessment, I realized that I had only included two word problems and they were not, in my opinion, of the most difficult type. I was aware of different types of word problems, but it wasn’t until I read Table 1 in the Glossary of the Common Core State Standards for Mathematics (p. 88) that I understood the distinctions. (http://www.corestandards.org/assets/CCSSI_Math%20Standards.pdf, p. 88) Not only are there four categories of word problems, (1) add to, (2) take from, (3) put together/take apart and (4) compare, but each category has different cases as well. For example, in “add to” and “take from” problems the result can be unknown, the change can be unknown, or the start can be unknown. Yes, my two measly word problems did not even scratch the surface. But then I had another thought. I had been focused on creating problems that were grade-level appropriate. What was I expecting students to show me for a solution? I tackled this and I came up with a drawing for each of my two word problems that is straightforward and makes sense to me. 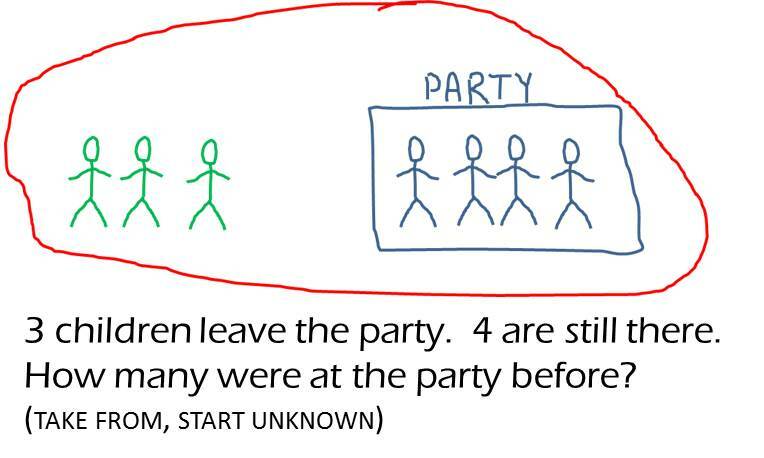 For example here is my take from, start unknown problem: 3 children leave the party. 4 are still there. How many were at the party before? As a solution to this problem, I drew the picture at the beginning of this post. Not bad. Makes sense. The more difficult problems are the compare problems. 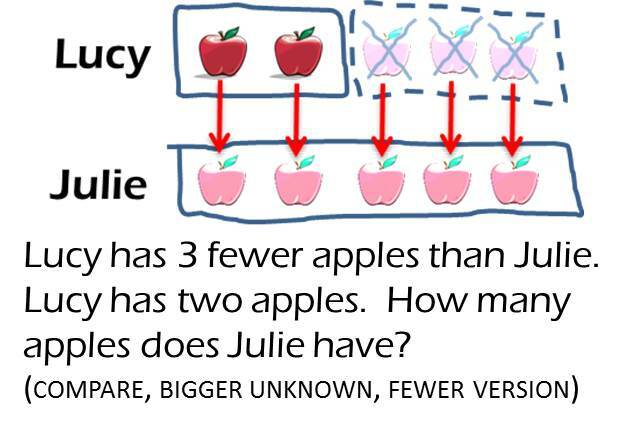 Here is an example of one of the more difficult problems taken from the Common Core State Standards for Mathematics: “Lucy has 3 fewer apples than Julie. Lucy has two apples. How many apples does Julie have?” (p. 88). That was the fewer version of a compare problem with a bigger unknown. Now, here is the more version: “Julie has 3 more apples than Lucy. Lucy has 2 apples. How many apples does Julie have?” See how much easier it is to understand the more version? I tried but couldn’t figure out a simple drawing that would work for the fewer version of the compare problem. I can solve it numerically, of course, but had trouble coming up with a good visual explanation. So, I researched models for comparison word problems and came up with several resources that model this kind of problem with a pair of bars. Thinkingblocks.com (http://www.thinkingblocks.com/TB_AS/tb_as3.html) has a video along with sample problems. The Minnesota Stem Teaching Center has a good discussion of several types of word problem models, and a little more than half-way down the page is a discussion of comparison problems using bar models (http://scimathmn.org/stemtc/resources/mathematics-best-practices/modeling-word-problems). Based on the concepts from these resources, I created a drawing for the fewer type of comparison word problem that combines both pictures and bars. It makes sense to me after-the fact, but doesn’t seem as intuitive to me as the other drawings. I think this approach would have to be taught. Which brings up another question: Are Kindergartners or even first graders solving problems like this now? It’s been several years since my daughter was in Kindergarten, but I don’t remember problems like this. If Common Core standards in post-primary grades presume these skills, are students prepared? If not, how are they going to catch up? This entry was posted in Uncategorized and tagged Common Core State Standards Initiative, compare word problems, Kindergarten, Math, Word problem (mathematics education), word problem models on April 27, 2013 by galenaylor. Above are the two Kindergarten assessments I created. Although my initial purpose for the assessments is to use them with older students, I attempted to make them appropriate for Kindergartners. Full disclosure: I am a secondary math teacher, not an elementary teacher. However, I have read Knowing and Teaching Elementary Mathematics by Liping Ma (fantastic book, I highly recommend it – thanks Jean M.!) I have also been researching elementary math tasks so I can better help a 6th grade student with whom I am working. I’m sure I will learn more as I use the assessments. Why two assessments? Well, some standards need to be assessed verbally (e.g., counting to 100 or counting out loud). Furthermore, I may want to see and hear the student’s performance. Specifically: How fluently is he adding or subtracting? Where is he hesitating? Even the written assessments are not intended to be completed in isolation; I plan to watch the student as he completes the problems. Again, I will see where he is fluent and where he hesitates or skips a problem. I will gain insight into any misconceptions as well as skills he may be lacking, which will help me decide the concepts I will need to reteach. Although the assessments may appear to be cast in stone, my intent is to use them more flexibly. So, (and I’m thinking out loud here) after the student demonstrates she can count by 1 to 20 or 30, I would stop and ask her to count by 1 from some higher number to 100 (which actually incorporates the second Kindergarten standard, K.CC.A.2). Ideally, I would then follow up with a question to see if she could explain the counting pattern. Also, if a student is really struggling with a problem, I would intervene. First I would start by asking some guiding questions to see if he could then figure it out. I might change the problem to be simpler or let him skip it all together. After all, these are not tests; I just want to know where the holes are. It is paramount that I keep it positive, that I keep the student talking to me. Teaching is as much art as it is science. I need to know when to push and when to back off. I need to know my students. Finally, I consider these assessments to be “first drafts” and plan to modify or change them after I use them and see how they work. What do you think? Am I on the right track? This entry was posted in Assessments and tagged Common Core State Standards Initiative, Educational assessment, Kindergarten, Mathematics, Teaching Resources on April 25, 2013 by galenaylor.